Ok – you must think I'm absolutely bonkers because Monday I was just complaining about the heat. And believe me, it's still hanging around. So why, you ask, am I roasting tomatoes in the oven and then simmering this roasted heirloom tomato soup on the stove?! Well, truthfully I made this about two weeks ago when it was still hot, but not the blistering hot it has been of late. I also had a cold around that same time and this is ALL.I.WANTED. I don't know what it is about getting a cold that makes you want something hot and flavorful- but not crazy flavorful, yet classic. 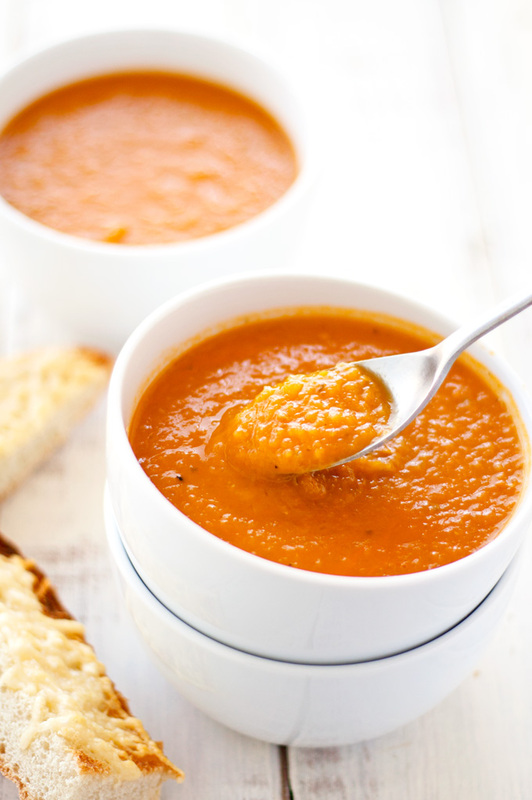 And what's more classic than a bowl of tomato soup with a simple grilled cheese sandwich along side to dip in it? For my first couple bowls I had the classic white bread with cheddar cheese sandwich, but for the photos I made these easy-to-dunk toasted cheese sticks. I was all about the heirloom tomatoes this summer. Trader Joe's had the mini ones that I could not get enough of – seriously I would grab a handful in the morning, like right after waking up, and just munch away. I'd toss them in salads, throw them on top of avocado toast, etc... 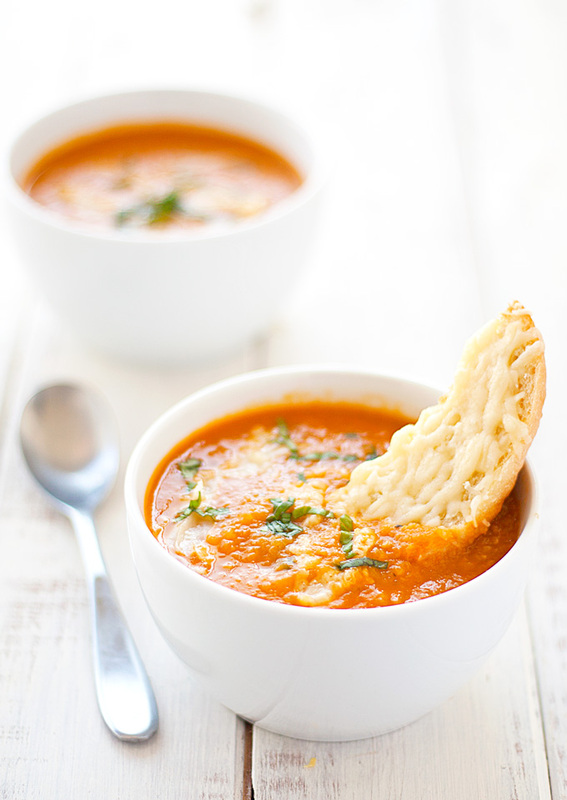 They also had the larger ones – perfect for salad, sandwiches and this soup! The extra step of roasting the tomatoes, alongside some garlic and onions, is completely worth it. 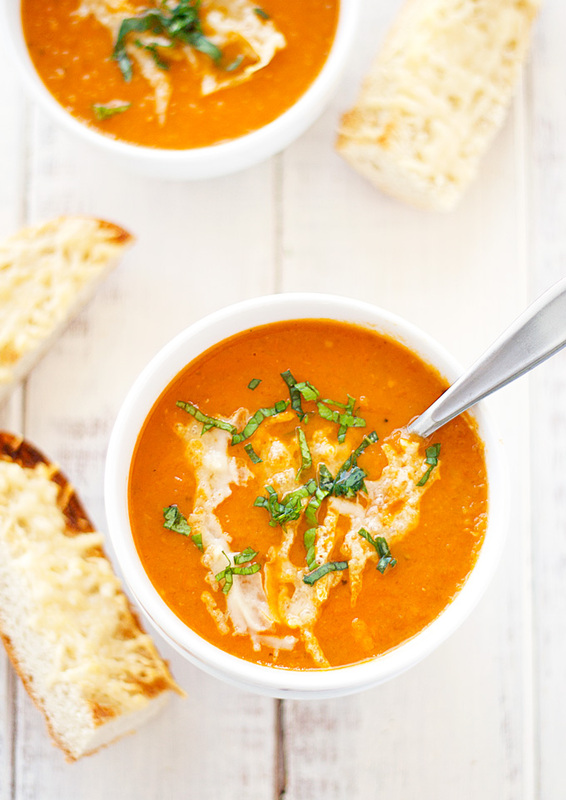 Truthfully, I could've stopped right there and went to town with a spoon, but it makes a wonderfully, delicious soup – so full of flavor, a hint of smokiness from the roasting, and the brightness of fresh tomatoes. I decided not to strain the soup after cooking, which you totally can, but I just couldn't part with those bits of flavor. We're talking fresh ground pepper, roasted tomato flesh, and the like. I pureed in my food processor and that was good enough for me. But if you're looking for a smoother, silkier consistency – please feel free to strain. 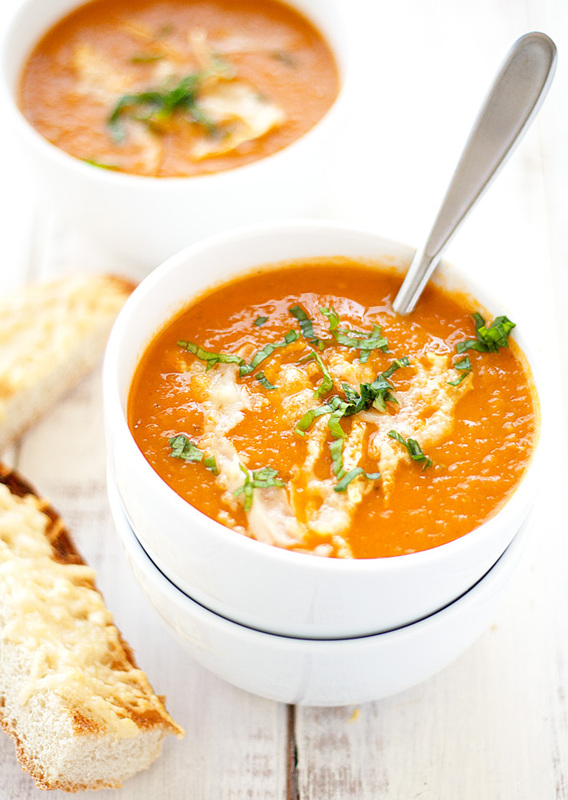 This is the perfect soup for everything – I mean it's tomato soup! 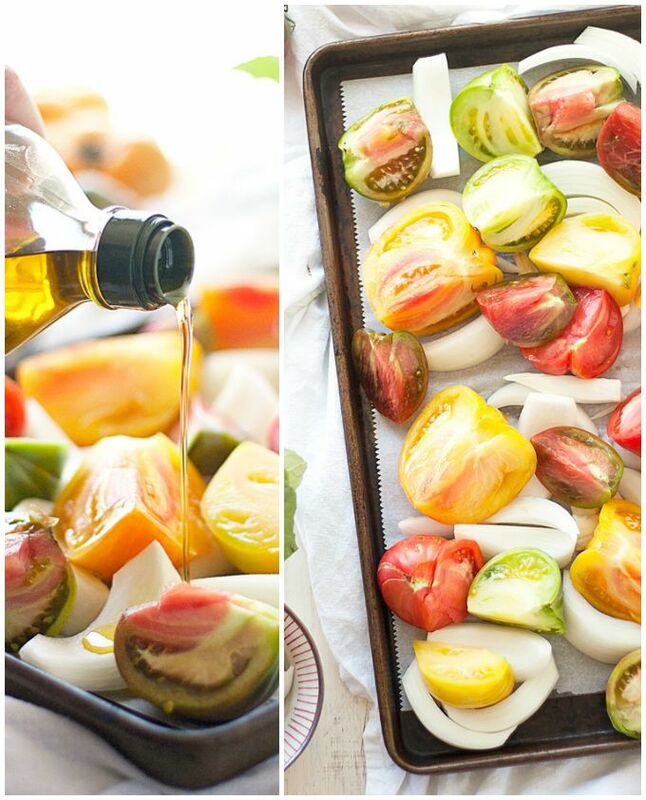 And if you can't find heirloom tomatoes, you can easily swap out your favorite tomatoes, the color just might not match mine. And don't forget the grilled cheese dunkers. Wash, core and cut the tomatoes into quarters. Spread the tomatoes, garlic and onions onto a baking tray. Drizzle with the olive oil and season with salt and pepper. Roast for 20 to 30 minutes or until everything is caramelized and all the juices are flowing. Remove the roasted tomatoes, onion and garlic from oven and transfer to a large stock pot. Add 3 cups of the chicken stock, bay leaves and butter. Bring to a boil and reduce heat to a simmer for 15 to 20 minutes or until liquid has reduced by a third. Wash and dry the basil leaves and add to the pot. Using an immersion blender (or transfer to a food processor in batches), blend the mixture until soup is smooth. You could strain the soup at this point if desired. Return soup to low heat and add additional cup of chicken stock to reach desired consistency. Serve in bowls garnished with Parmesan cheese.